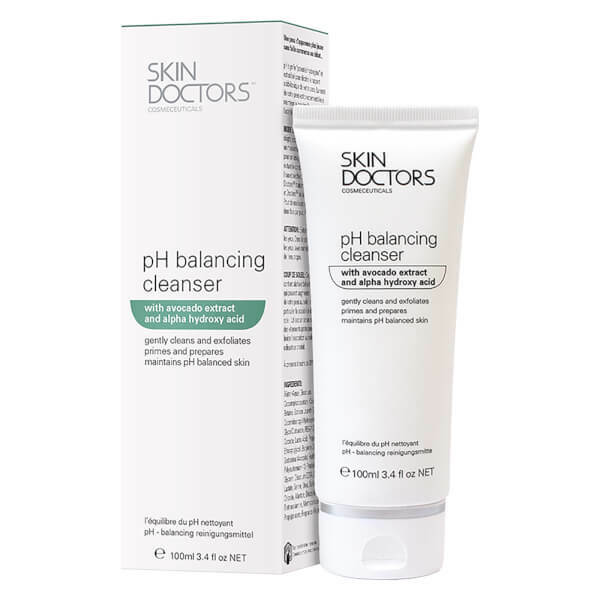 Refresh your complexion with the pH Balancing Face Cleanser from Skin Doctors. Synergising Lactic Acid and Cocamidopropyl Betane, the deeply cleansing formula gently eliminates dead, dull skin cells and unclogs pores, whilst maintaining the skin's pH level and increasing the absorption of other products. Working to improve the appearance of acne scars, blemishes and fine lines, the cleanser is infused with Alpha Hydroxy Acids to diminish excess oil, dirt and impurities and reveal a revitalised, clearer complexion. A dose of Avocado Extract nourishes and moisturises to leave you with regenerated, flawless skin and a youthful glow. Suitable for daily use. E.N. Dampen face and hands with warm water. Apply a liberal amount of pH Balancing Cleanser to the palm and work into gentle lather. Using fingertips, apply the cleanser in a circular motion to the face and neck, avoiding eye area. Use morning and night for maximum results.